To make this dish we need a pan like it is shown in the below picture. Add salt, chopped chillies, cilantro and onions to the dosa batter. Heat the pan and grease the pan, when the pan is hot pour the mixed batter into the holes. Cover with lid and cook on medium flame ofr 3 mits. Now flip these ponganalu to the other side with a spoon and repeat the process by placing lid and cooking for another 3-4 mits. Donot cook on high flame. We need very small Bitter gourd as shown in the below picture. Cook these bitter gourd in boiling water for 5 mis. Drain the water off and make cut to these and remove the seeds inside. If u like to have the seeds do not remove them. Now grind the coconut powder, garlic, ginger, turmeric, chilli powder, cumin and salt together. Now stuff this mixture into the bitter gourd. In a non stick pan heat oil and place the bitter gourd side by side and cook on medium flame for 5 mits and turn them on to cook on other side. Do not cook these on high fame. They cook with in notime as u already cooked the bitter gourd in the boiling water. Garnish with cilantro and serve as a side dish. 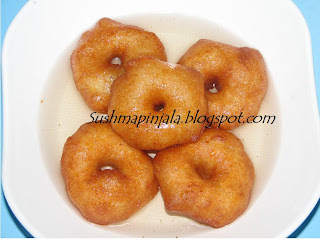 This is one of my fav snack, which my mom and my anti used to make. Never tried making these before marriage as my anti used to make for me. She even sent it to me to Mumbai where i was after marriage. Was missing appalu after coming to USA. 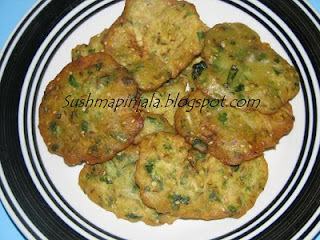 Last time when i went to India, was at my mom's place for Sankranthi, and my mom made these appalu for me. 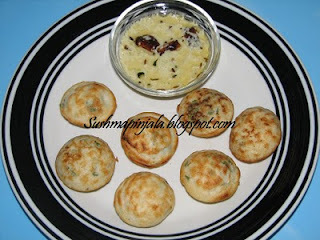 Soak udad dal for 4 hrs and grind it to thick paste as u do for normal vada. Now add chopped ginger and salt to the batter. Heat oil in pan deep fry making small vadas. 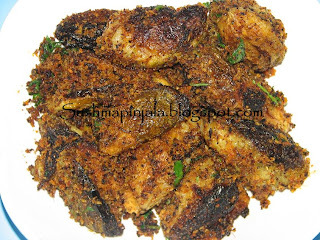 Fry the vadas till golden brown on medium flame and remove onto a paper towel. In a large bowl smoothen the curd and add 2 cups water and haldi. Heat a small pan to make tempering. Heat oil and add mustard seeds, cumin seeds, udad dal, curry leaves, red chilli, chopped green chillies and onions. Add this tempering to the curd prepared with adding water and haldi. 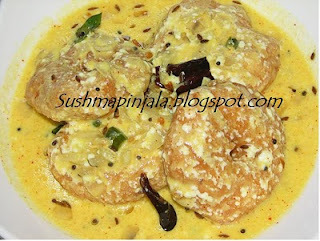 Now add the fried vadas to this curd. Add only few as u want them to soak completely into the curd. Soak udad dal for 4 hrs and grind it with very little water and little salt. It should be hard enough to make the vada. In a sauce pan add sugar and water to make sugar syrup. Make this syrup on medium flame. In another pan heat oil, make small small vadas and make a hole in the middle, directly drop one by one in the oil and fry them till golden brown on medium flame. When the syrup is done add elachi powder and keep aside. Drop these hot vadas into sugar syrup.